Butterflies now seem to be frequent visitors to my garden at this time of year. It is lovely to watch them land and stay a while on my plants. This year I plan to keep a closer eye on them to see how many types actually visit my Scottish garden. So far, I have seen the red admiral and the small tortoiseshell butterflies. Some garden plants attract more butterflies than others. Probably the most well known plant, in gardens and parks, is the Buddleja. It is also more commonly known, not surprisingly, as the butterfly bush. There are many varieties available at nurseries and garden centres but the one I have chosen to grow is quite a compact plant and I liked its silver grey foliage. The butterfly in the photo above is of a small tortoiseshell butterfly, in my front garden, thoroughly enjoying a good feed on one of my buddleja flowers. Verbena Bonariensis has become a very popular plant in garden centres over the last few years as it is seen used by many garden designers in show gardens. However, it too is a strong favourite for the butterflies. I have had in my garden for a number of years now. I grew my original plants from seed. However this plant isn’t always hardy with me so I have found myself lifting plants and keeping them in my small, unheated, greenhouse over the winter. It is perhaps likely as a result of being moved around my plants have really never ‘bulked up’. Therefore, my flowering stems have been limited which also makes them more vulnerable to strong winds too. A few days ago I spotted three very bulky, good sized, verbena bonariensis plants with a large number of flowering stems in a local garden centre. I instantly wondered how many butterflies could be counted on these plants when fully in flower and soon after found myself loading them into the car! Garden centres at this time of year often have many plants that are pot bound. When buying plants it isn’t often obvious that a plant is pot bound when the plant appears healthy. My plants were fine but in need of watering so I watered them a few times before I went to plant them today. However, the leaves began to look dried up and droopy and it wasn’t until I took them out of their pots that I realised why. They were incredibly pot bound as you will see in the photo above. Often the advice in this case is to tease the roots out a little but as my plants were already distressed I didn’t do this. Instead, I dug a bigger hole and added plenty of my good garden soil before laying the plant in the hole. I then removed the rose head from my watering can and, as Alan Titchmarsh a UK television gardener would say, puddled them in. When the water drained from my puddles I refilled the hole with soil around the plants and watered again. 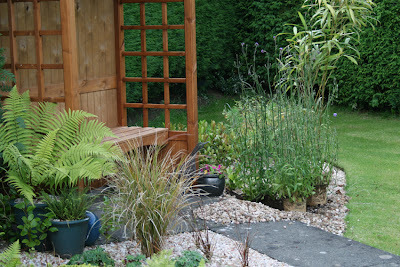 My plants were to have a gravel mulch so after this was done I refilled my watering can, replaced my rose head and watered high above the plant so the withered stems would get a good soaking. They got two full watering cans this time. Now, I will wait a few days to see if the plants pick up again. I am pretty confident that they will - but if necessary I will take much stronger action and do a bit of serious cutting back! I am optimistic though and look forward to seeing many butterflies on these plants. Hi, shirl! I grew verbena bonariensis in our garden one year, but it died during the tough winter weather. However, not to be beaten, I bought another one and planted it against a south-facing wall of the house. It has survived and grown tall...so I hope it will produce more stems next year. This year I bought another one and planted it in the middle of an established bed to see how it will fare. The first year we came here, we planted two buddleias, which died over the winter. Now the garden is so busy, I don't see and space to include one. What I did to attract the butterflies was to plant mainly nectar borders in my wildflower garden. I find inula daisies, which are yellow in colour, attract the butterflies more than any other plant I have growing in the garden. We have not had many butterflies this year so far, what with all the rainy weather. But In late August and early September, in most years, we get peacocks, red admirals, tortoiseshells, and small white and cabbage whites. I will post about them when they appear. 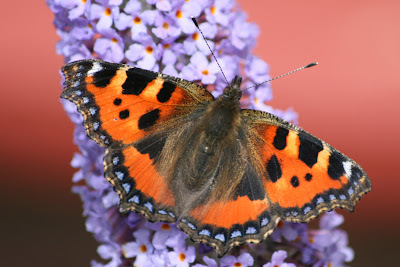 As in the above comment mentioned, we here too do not have many butterflies at the moment (also due to the rain), in spite of all the buddlejas I have in my garden. My fist v.bonariensis I brought back from UK some years ago. Now I have a djungle of them, they are everywhere in the garden..and I love them! Therefore I do hope, that there won't be a very, very cold winter again. However, if needs be, I have collected some seeds! Your planting action will be ok, I am sure too.....Alan Titmarch knows the good tricks!!! I didn't miss his Garden broadcastings when we could receive BBCPrime here in Switzerland. Yes, this verbena bonariensis is a little vulnerable to our winters in Scotland – it is well worth all the effort in protecting it though. I have grown it the middle of borders too but wonder if it needs more light at its crown as I have found the ones that have been partial covered by foliage from other plants don’t grow as well. It could also be the location. It does need support from winds so your wall location could be idea. My buddleja is compact but I never considered growing one before because of the space they can need either. A nectar bar sounds great. I have just looked on google to see what an inula daisy looks like. I can see why they are attractive to the butterflies. Funnily enough, I never thought of rain being an issue for butterflies! At the end of June we had a red admiral in the house, that we had to catch to release, and I have seen a few small tortoiseshells in the last few weeks. That’s why I added more plants to get more butterflies! I think I’ve see the little white ones too. I look forward to seeing your photos of butterflies at your nectar bar. As I said above I had never thought that rain was a problem for butterflies. Yes, a cold winter is a worry for many plants – I tend to take cuttings of favourites or lift plants now as a number of years ago I lost quite a few! My tiny, 6ftx4ft greenhouse is now at bursting point over the winter months! I have also collected seed in the last two years and have many little brown envelopes in a box now. Two of my v. Bonariensis plants look like they could be ok but I am not so sure about the third – I may need to prune that one yet. Wishing you lots of butterflies in your garden in Switzerland and happy gardening!